Colson Caster Corporation, the world’s leading manufacturer of standard and custom application caster and wheel products, has beefed up its engineering team again by adding another position. Darlene Thompson has been appointed as the company’s newest Engineering Assistant where she will be tasked with providing critical costing, routing, and bill-of-materials and product sampling for Colson’s internal engineering group. The company has also added Faith Taylor to its sales and service staff to assume the full-time Customer Service Representative position that Thompson vacated with her move. Thompson has been in Colson’s customer service group for more than five years and joined them with more than 14 years background in manufacturing and engineering support positions. A newcomer to Colson, Taylor brings more than 13 years of professional experience within the material handling industry and will be working with the company’s Mid-South regional sales representatives and customers. Both positions will be staffed from Colson’s headquarters offices in Jonesboro, Arkansas which house more than 95 employees with an average tenure of 15 years of service. 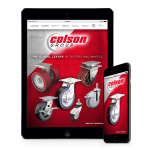 Colson has been in business for more than 125 years, and today manufactures and globally markets more than 35,000 fully-tested caster and wheel products.